The allure of drugs can be hard to resist when battling addiction, and further perpetuated when users revisit environments related to previous drug use. Fortunately, new research in mice suggests that individuals experiencing drug addiction who exercise regularly appear to be less vulnerable to environmental cues related to previous drug use. It appears that exercise alters the production of certain peptides within the brain that may strengthen users’ determination. An investigation by The Guardian’s “Observer” has found a synthetic cannabis substance in vape products falsely marketed as real cannabis. In recent years, there has been an exponential increase in vaping – a new trendy way of smoking which replaces conventional tobacco and marijuana cigarettes with an electronic cigarette, supposedly containing pure nicotine or cannabis instead. Like a cellphone or tablet, e-cigarettes are charged via a USB port and have a small electronic screen. Instead of burning dried tobacco or cannabis, vaporizers apply heat to an oil extraction of these constituents in which users can inhale. The hype of these cigarettes has been correlated with a certain lifestyle colloquially “vape nation” eliciting communities on Social Media platforms such as Instagram and YouTube. Despite the hype, it is still contested whether vaping is safer than conventional cigarettes. It appears that not all the risks associated with smoking are eradicated by electronic cigarettes – whether it be cannabis or tobacco (Budney, Sargent, & Lee, 2015). Observer, an investigatory arm of The Guardian conducted research on a major vape supplier “Kronic Juice” after they refused to make the ingredients of their products public. After having commissioned a laboratory test, Observer found that “Kronic Juice” contained a synthetic cannabis that was banned in 2016. Alarmingly, this is the same chemical that was sprayed on some plants. Customers of Kronic Juice have warned others about their experiences on Reddit, claiming the side-effects to be scary and distressful. One user reported feeling heavy, shaking, and experienced a dangerously high heart rate, more on this here. Another customer, Todd Renje, told the Guardian that he developed an addiction to this liquid spice. He was not able to go more than 20 or 30 minutes without the drug. If he abstained, he would begin to shake, feel nauseous, and get sweaty. Eventually he quit cold turkey and reported feeling violent symptoms of withdrawal: vomiting, shaking, and sweating. Unbeknownst to him, the withdrawal eventually lead to a seizure where he woke up in the hospital. The Kronic Juice website is no longer online. In fact, it was removed less than 24 hours after Observer sent them an e-mail with the results of their investigation. However, it is possible that other companies like Kronic Juice exist. It is important for prospective and pre-existing vapers to be aware of the risk(s) of purchasing vape juice from online companies who are especially discrete about the constituents of their product. 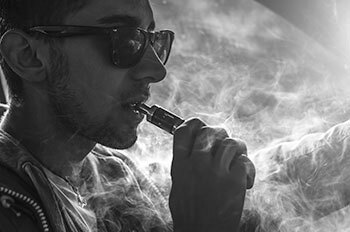 As it happens, vape pens for recreational cannabis consumption are not yet legal in Canada. Health Canada has indicated that more research is necessary. However, this does not mean that you cannot purchase these products in Canada or online. As such, it is important to understand that the research is still inconclusive, and you may compromise your health – especially in the case of synthetic cannabis. Further, it is still contested whether vaping helps with smoking cessation and some experts argue that it may lead to increased smoking behaviour (Hartmann-Boyce et al., 2016; Bullen et al., 2013; Caponnetto et al., 2013). Therefore, we encourage all cannabis vapers to perform in-depth research of suppliers in order to mitigate risk. Budney AJ, Sargent JD, Lee DC. Vaping cannabis (marijuana): parallel concerns to e-cigs?. Addiction. 2015;110(11):1699-704. Bullen C., Howe C., Laugesen M., McRobbie H., Parag V., Williman J. et al. Electronic cigarettes for smoking cessation: a randomised controlled trial. Lancet 2013; 382: 1629–1637. Hartmann‐Boyce J., McRobbie H., Bullen C., Begh R., Stead L. F., Hajek P. Electronic cigarettes for smoking cessation. Cochrane Database Syst Rev 2016; Issue 9. Art. No. : CD010216. https://doi.org/10.1002/14651858.CD010216.pub3.